Engaged in writing ever since he got out of sleep and vexed with it, Ramamurthy, the young clerk in Taluk office, pushing all the papers into the drawer, comes out of the office. He starts walking towards the park. Darkness is just spreading its tentacles. The cool breeze is struggling to get his numbed mind back to its normal state. 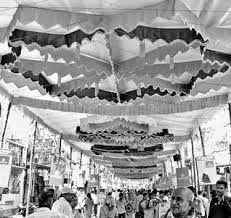 Throwing himself on a bench in the park, inhaling deeply and exhaling air leisurely, he, raising his head, casually glancing at the man sitting by his side and suddenly remembering something, looking at him intently, “Hey Subbarao!” exclaims Ramamurthy, keeping his hand on his shoulder. Wondering, turning to Ramamurthy and seeing him, “Oh You! Thought somebody else”, says the other man. Ramamurthy stares at him in surprise. He never thought that Subbarao would come up in education. Subbarao, who copied every solved sum from his notebook till the school final year, is today studying engineering! Ramamurthy could not believe it. Reminiscing about the old days, Ramamurthy says feebly, “Yes”. “What, what for? No money. Otherwise why would I stop”, says Ramamurthy sadly. He stood first in the school final examination. Tried his best to study further, but could not succeed. That very year his father died. So, out of compulsion he joined a government service. In the second year of the service, he got married too. All those days flashed in his mind vividly. MBBS! So, in a few years he would become a doctor. There appears none amongst his classmates who isn’t studying further. One is engineer, another is doctor—what else others might be studying! But, he is forever Ramamurthy, SSLC. Ramamurthy blushes. How scornfully these fellows, who copied the solved problems from his notebook from A to Z, are looking at him today! What is their greatness over me either in intelligence or in determination or in virtue? Could any one of them ever win a match of chess with me? These fellows, who stood on bench, period after period, are today engineers, doctors. He is but a taluk office clerk! They are, of course, superior to him in one aspect—wealth. It is unfair and a crime that with that one superiority they could acquire an opportunity to crush him into silence. If only he too were endowed with an opportunity to study in college…! Why to think of all this? What can be achieved by building castles in the air? No alternative, but to be content with the given. Determining to at least spend a few minutes with friends cheerfully, he says, “Please let me be in, in whatever you both are talking about”. “Hi…Hi…Hi… What can you understand about college affairs?” Laughs Viswanatham. “Hi…Hi…Hi…”, Subbarao too joins him. Ramamurthy, who, somehow swallowing the anger against his officer in the office came to park, not being able to put up with the insult being heaped upon him by friends, suddenly gets up and saying “See you”, starts for home. As Ramamurthy steps into the house, darkness was ruling the roost. “Why haven’t you lit the lantern?” says he peevishly to his wife. “Ask the broken glass pieces”, says Janaki indifferently. “You should have then lit the lamp?” says Ramamurthy. “No kerosene in the house”. “OK, at least lit that buddi”. Fishing out matchbox from his pocket, Ramamurthy flings it at her with force. “Move away for a while from here”. “There is only one room”. “Chi! You are making my life restless”, says Ramamurthy in abhorrence. Janaki stares at him angrily—revoltingly. Involuntarily, tears roll down from Janaki’s eyes. She never thought that her life will be like this even in dreams. Four years back, all her aspirations, intentions had all been mercilessly thrown off. She was not uneducated—studied up to SSLC, though could not complete it. Reminiscing over her feelings, perceptions of those days, she feels sad. Despite her beauty, education and good intentions she was to marry a man, who had studied equivalent to her, an ordinary clerk, that too, much against her wish, for she was poor. In just a minute all her desires had become stars in the sky. She never thought even in dreams that she would one day lead a life full of troubles, impoverishment and abuses of the husband. Whatever might be the other things, if only her husband had treated her well there would have been no pain. But, having something working upon his mind, he, pinned by it, always displayed an irritating disposition at home. True, work might be heavy, but then, are all behaving like this? Why to show his anger against somebody of the office here at home? All said and done, how one can own such a culture when one is not that educated! She had craved to marry a person who was at least a BA. But why now quarrying those longings and cribbing at them—what for? Whatever had to happen, had happened. Why this dirty thought now? 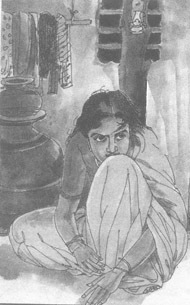 Hearing Ramamurthy’s question, Janaki returns from her dream world. What is that asking? Her feelings which had just compromised again revolted. Mechanically, she gets up and serves food. Staring at her irritatingly, Ramamurthy starts eating. “Cat had turned it down”. “As if there is only one work—to keep a watch on cat”. “What can you do? Jump into well”, says Ramamurthy furiously. “You are proving well that a clerk’s authority runs only at home”. “What, uttering?” Getting up angrily, Ramamurthy spanks Janaki on her cheek with all the force at his command. Holding back tears, Janaki turns her head aside. Janaki wipes away her tears with the hem of her sari. “Ask Janaki, ask”, yells Ramamurthy. Keeping his palm on the table, he hits his fingers with the ruler that he had brought from office for drawing statements, using all his force. Hearing the sound, Janaki, raising her head and seeing the swollen palm of Ramamurthy, shrieks. Looking at his hand, Ramamurthy laughs like a mad fellow. “The other hand will henceforth behave”. “Janaki, before marriage I used to pity myself, now I have to feel pity seeing you too. The despair of two living beings, the pain caused by my insatiate desires, have all made me restless. Merely due to lack of money, my intellect…my life is becoming useless. Similarly, your desires and beauty are becoming useless … merely for want of money. I know. You haven’t visualized even in dreams that a man like me would ever become your husband. I do know I am not a match to you. Nothing special in me. What I have studied had been studied by you too. You are more good-looking than I. So what, you don’t have wealth. Therefore, you have no joy. Same is with me too. For there is no money, I have no education. For I have no education, I have no joy. Because of the absence of these two, I have no peace. “I would never again say like that”, says Janaki tenderly. “What is this, I never thought that you are feeling so sorry of all this”, says Janaki sympathetically. “Oh! not me, the ghost has possessed you only", says Janaki.